The FDA approved the first robotic surgery system in 2000. Since then, over three million operations of many types have been performed with the da Vinci Surgical System alone. 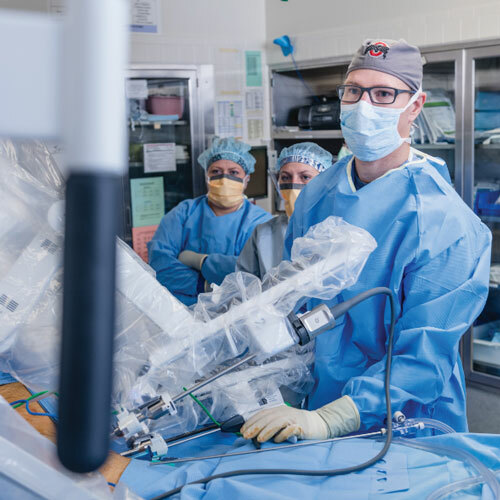 As a regional leader in robotic surgery, including having the most experienced robotic general surgeon in the Twin Cities, both of our hospitals are equipped with the da Vinci Surgical System and a specially trained team to perform minimally invasive, robotic procedures. We perform robotic surgery in a wide range of specialties and do things differently here. We were the first bariatric and metabolic robotics program in the region. After being the busiest single-robot program in the five-state area, Maple Grove Hospital added a second robot to meet demand. We are one of only three programs in the region performing robotic oral and maxillofacial surgeries. North Memorial Health Hospital in Robbinsdale is the first multi-robot hospital in the metro area to standardize its robotic technology to the latest 4th generation platform. At Maple Grove Hospital, we’re known for our women’s health robotic services for such things as a hysterectomy, endometriosis resection, sacrocolpopexy and myomectomy. Two surgeons combined have done more than 650 of these procedures. North Memorial Health Hospital in Robbinsdale is one of only six hospitals in the Twin Cities offering da Vinci surgery for pulmonary lobectomy procedures. We are one of two official general surgery da Vinci mentor sites in Minnesota. Robotic surgery can be performed across many surgery types ranging from bariatric and oncologic to cardiothoracic and gynecologic. Wondering if your customer could benefit from robotic surgery? Learn more.